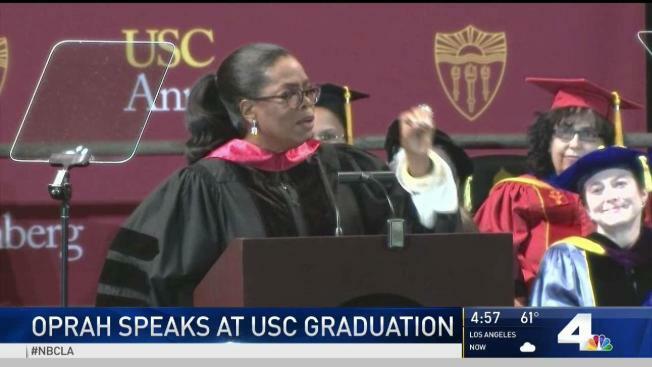 Oprah Winfrey figured it was safe to talk about politics again as she stood in front of a crowd of graduates at the University of Southern California. Winfrey joked, "The rumors from my last big speech have finally died down." That speech, at the Golden Globe Awards in January, brought talk of a presidential run. Friday's commencement address at USC's Annenberg School for Communication and Journalism stuck with more standard inspirational fare. She urged the graduates to vote, emphasized the importance of public service and asked the future journalists and public communicators to be warriors for truth in a time of rampant misinformation. And she gave plenty of ordinary advice: Remember to recycle, don't scrimp on shoes and "for God's sake put your phone down at the dinner table."